If you thought Peter Jackson's The Hobbit trilogy was entirely too long... you're not alone. Peter Jackson's The Hobbit trilogy was great for Lord of The Rings fans who were hungry for more hobbit-on-orc action, but many felt it was a tad... long. Unlike The Lord of the Rings, which was three books, The Hobbit was but a single book, though it was still stretched out to make three movies. One endearing Tolkien fan has gone ahead and, well, "un-streched" the trilogy, cutting all three Hobbit films into a single, four-hour movie. 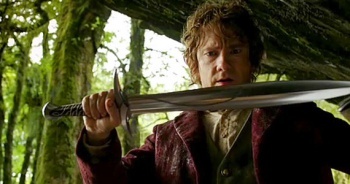 Tolkieneditor admits that he hasn't cut all the fat, and has left quite a few scenes un-tampered, such as Bilbo's encounter with Gollum, the spider battle, and his conversation of Smaug, because he was impressed with their portrayal. While Tolkieneditor offers fans links to torrent his fan portrayal of the movie, we won't be linking to them here, as it is still piracy, something that The Escapist does not approve of in any way. What do you think of The Hobbit? Did it really need to be three films?